The drive from Singapore to Malacca took about three hours, we had to stop twice for customs formalities, once to leave Singapore, and a second time, across the bridge to enter Malaysia. The road to Malacca was new, fast and not too busy so it was an easy journey. Along the way we were interested (alarmed?) to see the endless mile after mile of palm oil plantations, native rain forest is burned to clear ground for this lucrative crop, in the process valuable diverse forest is lost and the habitat of Orang Utans and other animals destroyed. 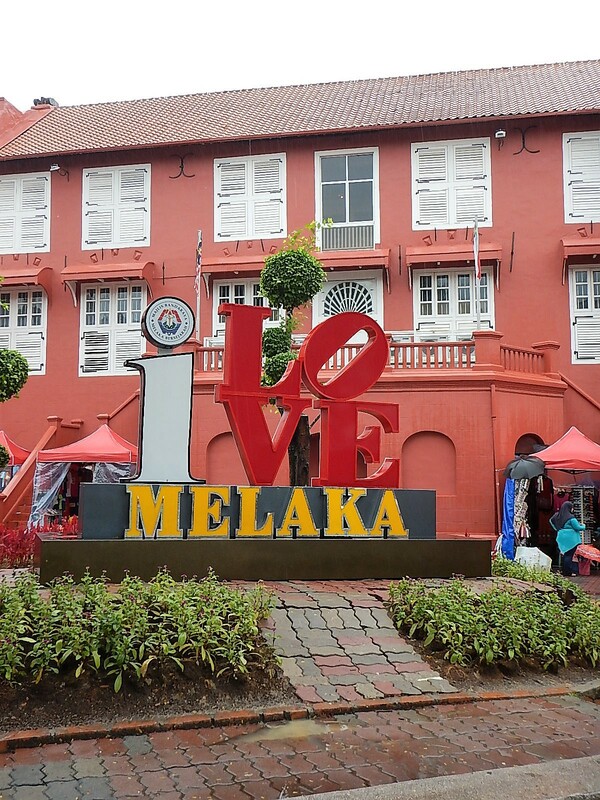 Our first stop in Malaysia, Malacca, is an historic port town which has been a trading centre since the 1500’s, under Malaysian rule, and Dutch, Portuguese, English and Japaneses occupation. The old town has been declared a World Heritage site, we have lost count of how many of those we have visited on our travels. Our hotel, Courtyard @ Heeren was in the middle of the old town on a road running parallel with Jonkers Walk; tourist central and sight of a famous weekend night market. The hotel has just 24 rooms set in an old Chinese merchant’s house, one of the heritage buildings that secured Malacca its UNESCO status. The rooms were spread across two floors and arranged around a series of open courtyards with balconies. Our room was the last of the old rooms (there is a very sympathetic modern extension at the back) with double wooden doors that open onto a garden courtyard with the original well. The room was simple but comfortable and retained many historic characteristics. We went straight out for a walk around the old town to get our bearings; we found Jonkers street, starting to prepare for the market; crossed the bridge across the river to see the Dutch Stadhuys and clock tower; and walked along the river bank to where a new hotel complex has been built. Later that evening we went out again to see the market which was alive with stalls selling all kinds of street food, souvenirs and trinkets and was decorated with lanterns for the Chinese New Year next weekend. After the market, we found a restaurant by the river and enjoyed some local dishes before heading back to the hotel. It was a good job we had a look around when we arrived because it poured with rain for the next two days! 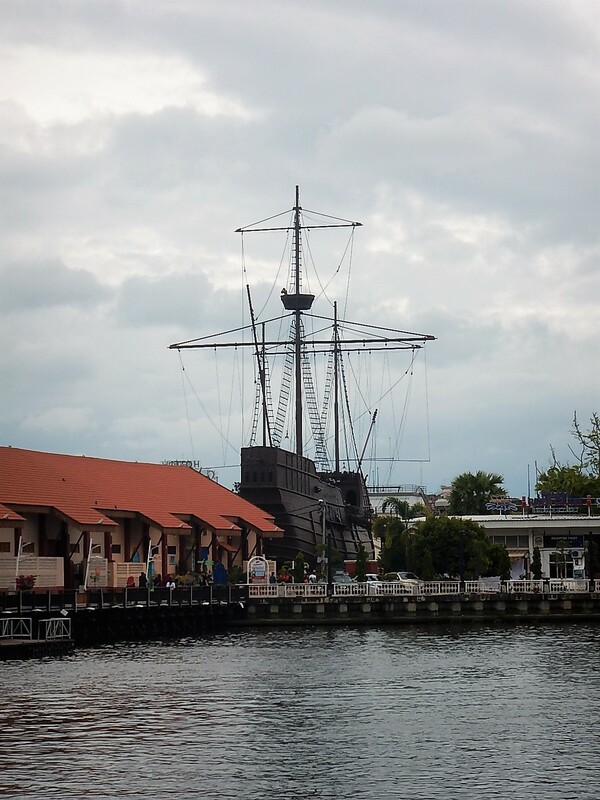 We did go out on Monday, to visit a local museum the Baba and Nyonya Museum which explains the traditional Peranakan or Straits Chinese culture. It is set in a restored Paranakan house and we were shown round by a local guide who brought the whole place to life with stories about the family who lived there. We also went to a restaurant called The Baboon House for lunch, it had been recommended as serving excellent burgers and, more importantly, it was next door to the hotel so we could get there without getting wet!